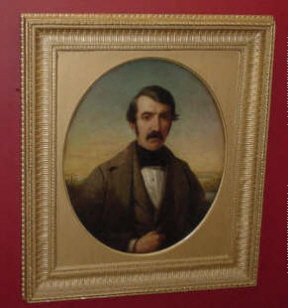 This is a picture of David Livingstone taken at the memorial house situated in the small hamlet of Blantyre, Scotland. Dr. David Livingstone (1813-1873) was one of the greatest explorers of the African continent, along the way pioneering the abolition of the slave trade. When no one had heard from him for several years while he was exploring the interior of the continent in the 1860s and his long absence became a matter of international concern. In response to this, the New York Herald sent explorer Henry M. Stanley to find him in 1869. Stanley finally found Livingstone in November 1871 in a small town on Lake Tanganyika. He greeted Livingstone with the now famous words, "Dr. Livingstone, I presume." Few Europeans have contributed as much to the exploration of Africa as the gentle Scottish missionary named David Livingstone. Livingstone was a curious combination of missionary, doctor, explorer, scientist and anti-slavery activist. He spent 30 years in Africa, exploring almost a third of the continent, from its southern tip and He was the first white man to see Victoria Falls. However, despite his best efforts he never discovered the source of the Nile, one of his major goals. He did however eliminate some possibilities and thereby helped direct the efforts of others.